Oh, my dears, I did so much miss all of you while I was out there on the other side of the ‘Glades. I also missed my computer, my laptop, my netbook, and my iPod — all of which keep me up to date with the wonderful world of science and technology. Today, though, my heart sings like a lark as I listen to The Nano Song and grow ever hopeful that a true space elevator is in our future because that will truly make it so much easier for me to be the first person to take an apple pie to the moon. Yes! I’m headed home from a long trip to the Northwest, and I really just can’t wait to get home to SoFLA and find out what all you all at the Slice of Heaven 24-Hour Pie Shop and Driving Range have been up to in my absence. My apprentice Prentiss at least sent me a message today, just a few hours ago, in fact to tell me she misses me. I suspect she just now noticed that I’ve been gone for a week. Sue Ten also called to say she’ll be heading out of town shortly after I get back, so the changing of the guard will be quick and efficient. Neither Prentiss nor Sue Ten had much to report. I take this to mean that all is well, or they just really don’t want me to worry about anything in advance. I haven’t heard about any zombie attacks on SoFLA, so I will just hope for the best, and expect the worst, as usual. In my week in Seattle and points north, I saw very little evidence of golf. There was that one woman on the Bainbridge Ferry, though. Then, in the SeaTac airport this morning, I saw the odd little sculpture below. I sent a copy of the photo to the Morning Guy, and he did not seem to find it as amusing as I did. I can tell he’s already thinking ahead to long-term maintenance and is worried about me cluttering up the dooryard with such junk. If it were a little smaller, though, it might make a great hood ornament for the E-Z cart, or maybe it could ride on the roof. I’ll have to take that up with Joe Sparkle Junior. I’ve been passing some of my flight time paging through the “Sky Mall” book, which is my son Chandler’s favorite magazine. His twin sister Rose prefers the parody version, “Sky Maul,” and I have trouble telling the two books apart. I’d hoped to find some nice golf gadgets in Sky Mall, but I am sadly disappointed. The one true golf item that I can find is a collection of 14 “club links” which are little monogrammed discs to be affixed to one’s clubs. They are available in goldtone, silvertone, or black aluminum; no pink, no Palm Beach green. The message seems to be that these are for people in the habit of losing their clubs. I don’t think I’ll be encouraging this trend: If we help people identify their lost clubs, then we are only cutting down on our supply of rental and “try this” clubs. I will, however, tell Sue Ten about the Sky Mall’s “Giant 8-in Cupcake” which is supposedly easy to make, and fun to serve. You know as well as I do that she is always looking for something fun to serve, and yes she is still ready to serve. I’m hoping she’ll be joining the FOAS (food on a stick) movement, soon, too. FOAS is not only fun to serve, but can be fun to eat, too, especially FFOAS (fried food on a stick) and DFFOAS (deep-fried food on a stick). Yes, Sue Ten is ready to serve, just like Sarah Palin – remember her? — and I am ready to eat. Too many days in the Northwest seem to have turned my head to thoughts of warmer clothing, even as I am mere hours from my flip-flops and shorts, so I’ve got to say I am fascinated by the Sky Mall’s “Carbon Fiber Heated Vest.” I’m not quite sure how this works, but I’m all for new technology and I’ve got to tell you that the phrase “laminated microfleece fabric” has the same distracting effect on me as seeing something shiny out of the corner of my eye. Yes, I want it, and I don’t know why. I’m pretty sure it will improve my golf game on nights when the temps in SoFLA dip dangerously below 70. I need to be prepared. Another tempting item in the catalog is the Kodak EasyShare Wireless Digital Frame, which promises, “The Power of the Internet, Now in Your Picture Frame.” If I can have the Power of the Internet in a picture frame, why not in my golf bag, my pinkie ring, or even my rose tattoo? I’m intrigued. And, yes, Sky Mall does sell the “Swami Golf GPS” but I think they should combine GPS unit’s “Insta-Lok” technology with their “Electronic Feng Shui Compass,” and if they do that, I’ll be happy to become the exclusive SoFLA distributer. Really, what could be better than GPS Feng Shui – for golfers? Find out how far away the dragon is, align your shot accordingly, live well, and prosper. Supposedly, the Feng Shui compass operates “with the same compass technology used in aerospace guidance systems,” and that’s not all! It also locates and calculates energy fields to help you align your physical surroundings. I can’t wait to get one of those for the driving range. We may have to move a few palm trees around, and reroute our feral green iguana Hercules on his daily stroll, but I’m sure this will all pay off in better golf for all of us, with or without the Swami GPS Golf option. All right, my dears. We are just about to land, and you know I’ll soon be out on the range under the lights, so come on by. I’ve got hours to go before I sleep, but if I don’t see you tonight, I hope to visit with you soon at the pie shop. Remember, Prentiss and I are a long way from finding the perfect slice of Key lime, so send in your pictures and recipes, or drop in and sample our latest possibilities. At least this time I remembered the camera. All right, my dears, I did find Key lime in the Northwest, despite our initial stumbling block of the possibility that it might truly turn out to be a “seasonal” dish. Seriously: They’ve got a point. January is not a good time for the Washington State citrus crop. Here’s a shot of the pie served at Flyers in Oak Harbor, Washington. I should never order this sandwich because I know it will never be as good as the one I had at the Limelight Cafe in Denver in 1972, but I am – as well you know by now – an optimist. Golf, after all, is a game for optimists, and so is the search for the perfect slice of Key lime pie. Needless to say, the pie at Flyers met our expectations, which were low. We gave them points for presentation, and for adding nuts to the crumb crust, but the overall impression was that the whole concoction had only recently come out of the deep freeze. “Fresh” was not a word that sprang to mind, or to tongue. The next day, we ventured by ferry to Port Townsend, and enjoyed some time out in the water. Granted, we were inside the ferry with our toes close to the heater, but we were there. I have a vague memory or two of being in Port Townsend before. Maybe you were there with me? I’m pretty sure Little Peach was my chaperone on at least one trip to that part of the world, and I did miss her this time around. She has such a wonderful knack for asking all the right questions, and that’s a gift that I envy. Traveling without her is always difficult, and when I get home, I know I will hardly be able to answer half of her well-placed questions, just because I didn’t ask. Ah, well. In Port Townsend, this time, I did have a marvelous piece of salmon for lunch, perfect in every way. I left a gold star on the menu on my way out the door. We did give this particular slice of pie high marks for the chocolate crust, yes indeed. I like a little experimentation, when the results pay off. The filling, though, was exceedingly tart. We weren’t surprised, though, since we had already leafed through the restaurant’s cookbook, in fact we bought a copy, so we knew this particular offering was full of lime juice, no mention of fresh limes. At least they did not spoil the pretty presentation with a garnish of Persian lime, and I liked how the whipped cream was a decorative option. I copied the recipe, which was pretty basic. Just speak up if you want a copy so you can try it out yourself, and let me know what you think. It might be just the ticket to make you think of sunny SoFLA when you, too, are far from home. Please join with me in saying farewell to the Phoenix Mars Lander, and all the brave little robots who have gone on before. Are there pie shops or driving ranges on Mars? Now we may never know. If you are reading this, then my mission is probably over. This final entry is one that I asked be posted after my mission team announces they’ve lost contact with me. Today is that day and I must say good-bye, but I do it in triumph and not in grief. As I’ve said before, there’s no other place I’d rather be than here. My mission lasted five months instead of three, and I’m content knowing that I worked hard and accomplished great things during that time. My work here is done, but I leave behind a legacy of images and data. In that sense, you haven’t heard the end of me. Scientists will be releasing findings based on my data for months, possibly years, to come and today’s children will read of my discoveries in their textbooks. Engineers will use my experience during landing and surface operations to aid in designing future robotic missions. But for now, it’s time for me to hunker down and brave what will be a long and cold autumn and winter. Temperatures should reach -199F (-128C) and a polar cap of carbon dioxide ice will envelop me in an icy tomb. Seasons on Mars last about twice as long as seasons on Earth, so if you’re wondering when the next Martian spring in the northern hemisphere begins, it’s one Earth-year away—October 27, 2009. The next Martian summer solstice, when maximum sunlight would hit my solar arrays, falls on May 13, 2010. That’s a long time away. And it’s one of the reasons there isn’t much hope that I’ll ever contact home again. For my mission teams on Earth, I bid a special farewell and thank you. For the thousands of you who joined me on this journey with your correspondence, I will miss you dearly. I hope you’ll look to my kindred robotic explorers as they seek to further humankind’s quest to learn and understand our place in the universe. The rovers, Spirit and Opportunity (@MarsRovers), are still operating in their sun belt locations closer to the Martian equator; Cassini (@CassiniSaturn) is sailing around Saturn and its rings; and the Mars Science Laboratory (@MarsScienceLab)—the biggest rover ever built for launch to another planet—is being carefully pieced together for launch next year. My mission team has promised to update my Twitter feed as more of my science discoveries are announced. If I’m lucky, perhaps one of the orbiters will snap a photo of me when spring comes around. So long Earth. I’ll be here to greet the next explorers to arrive, be they robot or human. It’s been a great pleasure to have Mars Phoenix guest blogging for us, reminiscing back on a successful mission via its personality conjurer, the great Veronica McGregor at JPL—maintainer of Phoenix’s famous Twitter feed. Just as Doug McCuistion from NASA said on the news conference today, it’s certainly more of an Irish wake than a funeral today. We’re drinking to you tonight, little buddy. You can see all of Phoenix’s previous entries and the official press release announcing the end of Phoenix’s mission. Created by the American Pie Council®, National Pie Day is dedicated to the celebration of pie. As part of our American heritage, this day is a perfect opportunity to pass on the love and enjoyment of pie eating and pie making to future generations. Each year the American Pie Council® sponsors the National Pie Championships® where some of the best pie makers in the United States and Canada enter their pies to compete for the “American Pie Council’s® Best Pie in America” award. For more information on who has the best pies in America, Click here. To celebrate National Pie Day share the warmth of the ultimate “comfort food” by giving the gift of pie to a friend or neighbor. Your generosity will be long remembered. If pie making is not in your schedule, stop by your favorite pie shop or grocery store and bring home a gift of love and enjoyment for the whole family. The coldest of January days will be warmed by a special pie dessert. Watch for winning recipes on our web site or first hand in our newsletter, Pie Times by joining the American Pie Council®. To get tips on getting media coverage for your company on NPD, Click here. (Downloadable PDF). 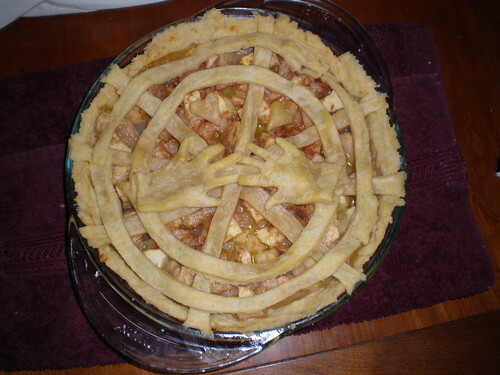 Holding Hands Pie, created by Emily Alden Foster. You can read her blog at http://whatisupwithemily.blogspot.com. We recommend it, with or without coffee and whipped cream. She made this particular pie for my son’s birthday. What a girl! “Just peel the onion,” they say. I say “Nothing,” but I am wrong. and space of course is full of stars. to turn itself into critical thinking. Opine to your heart’s desire. to give it that special zip. of bread dough and minced onion. could not see inside the onion. Serve in a paper bag. Try to think your way out of it.